A subtle mix of gorgeous pastel colours to add colour to your garden. An easy-to-grow perennial in a warm, soft mix of colours. A great contrast to other, broader leaved plants in your flower garden. Delivered to you as garden-ready plants for immediate planting. Just picture it, mounds of fragrant, fern-like foliage and the most amazing flat blooms of super pastel colours all summer! A warm, soft mix of achilleas, this easy to grow perennial is well suited to any sunny situation and will tolerate even poor soil. 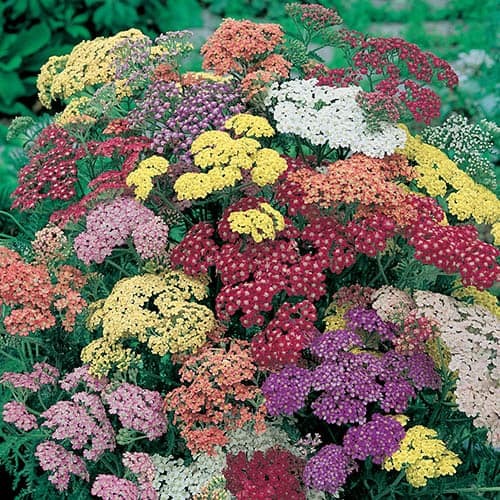 A good choice for a cut flower garden, Achillea produces flat table-tops of flowers in a range of pastel colours during early summer. These perennials make a great contrast to other, broader leaved plants in your flower garden. Delivered to you as garden ready plants at the perfect stage of development and ready to romp away once planted. Perennials tend to be easy to look after, needing just regular watering and a general purpose feed once a fortnight when in full growth. Old stems can be cut back in late autumn, or left on the plants for winter interest in the garden.